Rocks and shells have swirled around in this rock for a long time to make this bowl. Mary MacADNski: It is the size of a large cereal bowl. It always excites me when I come upon holes like this in the sandstones outcrops on beaches, Mary. Mary MacADNski: Some places in the world (Sydney, AU, for one) get really beautifully carved sandstone. We do not other than this type of carving. Mary MacADNski: It is a home for these snails for this low tide. Mary MacADNski: Round and round, the rocks go. Mary MacADNski: Thought you might like the sign. Mother Nature sure knows how to have fun like that, Mary. And, yes, what a fun/funny sign! Mary MacADNski: Punny/funny was what my weird little thing meant. Wanted to tell you too that I bought a colouring book on Thursday. I joined the trend. An incedible feat of nature. I wonder just how many years it to too to get to this state? Mary MacADNski: I wonder that too, Alan. I loved the sign. I love thses holes ground out by water and stone Mary, I am always fascinated by the process. That sign below is very funny. Mary MacADNski: I hope the snails are cot confined there. Had I thought about it then I would have moved these snails and put a couple of surely dead ones in. i like both the shots, Mary. the second shot is amusing. Mary MacADNski: Thanks, Ayush, a clever sign. Mary MacADNski: Our water is very clear considering it is on sandstone. It's wonderful how nature produces things like that I always think. The sign is very amusing. Mary MacADNski: Mother nature doesn't even have to do much but arrange the rocks. It is wonderful to see that 'nature' has fun creating nice things...wonderful find. Mary MacADNski: I think you should read the sign again, AStrid. It is a pun. I wouldn't quite go so far, but it is a nice time of year. 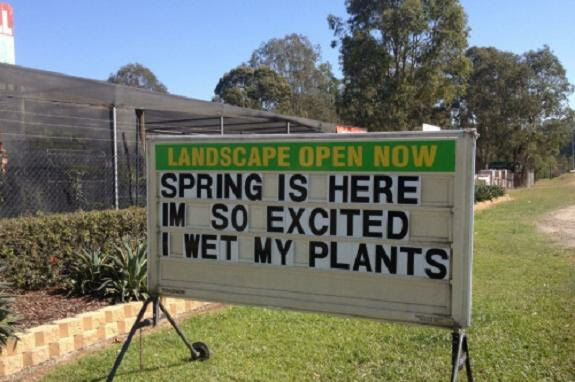 Mary MacADNski: It is a funny sign for someone into plants. That bowl is so perfect, Mary. Love the sign. Can you believe I have a bluebell in the garden about to open its petals in March. Mary MacADNski: You are way ahead of us though we have had a great winter. I have daffodils up a couple of inches when i CHECKED LAST WEEKEND. Amazing what nature can do! Mary MacADNski: It most certainly is. How good is that, great sign too, Mary. Mary MacADNski: Children love finding things like this. I love the sign! And interesting bowl. Isn't nature amazing. Mary MacADNski: Nature is the best artist. I love the sign too.